'Liberté, égalité, fraternité' is the motto of the French republic, and the premise behind three films directed by Krzysztof Kieślowski. Although released in the early 1990s, the genesis of the three films Blue (1993), White (1994) and Red (1994) can be traced back to almost a decade earlier, when Kieślowski met lawyer Krzysztof Piesiewicz while researching a film which would eventually become No End / Bez końca (1985). The two forged a strong friendship and collaboration which was to last until Kieślowski's untimely death in 1996. No End was also the beginning of another partnership, with composer Zbigniew Preisner, who would score all of Kieślowski's later films. The trio worked together on Decalogue / Dekalog (1989), a collection of ten hour-long films loosely based on the ten commandments. At around the same time Kieślowski and Piesiewicz, who had taken on the role of screenwriter, began working on some ideas with a more international appeal. The result was The double life of Veronique / Podwójne życie Weroniki (1991) and the colours trilogy. The colours of the French flag punctuate each of their films, adding yet another layer to the rich palimpsest that Kieślowski creates from his gripping narratives, wrote Colin MacCabe (Three Colors: A Hymn to European Cinema). For they are all at the service of his abiding concerns: that each moment is full of infinite possibility, that our lives are connected and interconnected in ways that we can never fully grasp. The conclusion of the trilogy, when our major characters emerge from a tragic accident, both delivers the pleasure of a happy ending and leaves us all too aware of the five hundred deaths that the narrative has not had time for – an open ending without equal. Although these films have since become classics watched the world over, it was hard for Kieślowski to created a truly international film. I always thought of myself as a director of small, provincial films which wouldn't find their way out of Poland. For a long time, I had thought this because they deal with Polish issues. But then it turned out that the things you can show in Poland and were presumably connected with Poland, had a universal quality. 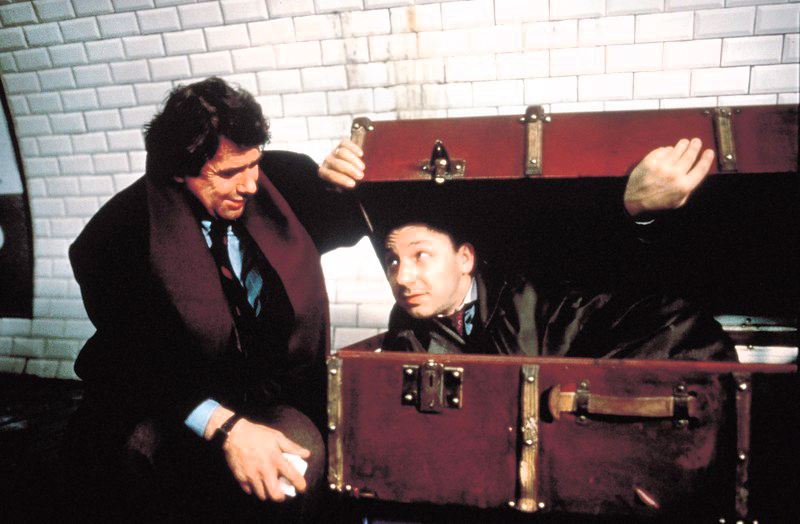 It turns out that people who have no connection to Poland, can still identify with these films, and connect with them (Conversation With Kieslowski by Elizabeth Ayre, Ruben Korenfeld, 1991). The first in the trilogy, Blue, follows Julie (Juliette Binoche) who loses her composer husband and daughter in a car accident. She must then come to terms with her loss and find reason for her life. 'It’s also generally said that Blue is an antitragedy, just as White is an anticomedy and Red an antiromance,' wrote Nick James in Blue: Bare Necessities, adding that 'Blue’s idea of freedom is willfully perverse'. Of central importance to the film is its musical element – Julie's late husband was a world-renowned composer, and his widow has a love-hate relationship with his last unfinished symphony. Preisner wrote the film's exquisite score, which forms a strong backbone to the narration. In one scene, Julie is sitting in a cafe while some music is wafting in the background. She is having a conversation with a man who is seemingly intently listening to the music, which turns out to be music Julie's husband had written, played by a street musician outside. The scene also highlights another pivotal component of the film: Sławomir Idziak's delicate cinematography. In Blue, he used several blue filters over the lens, immersing the film in a blue haze. 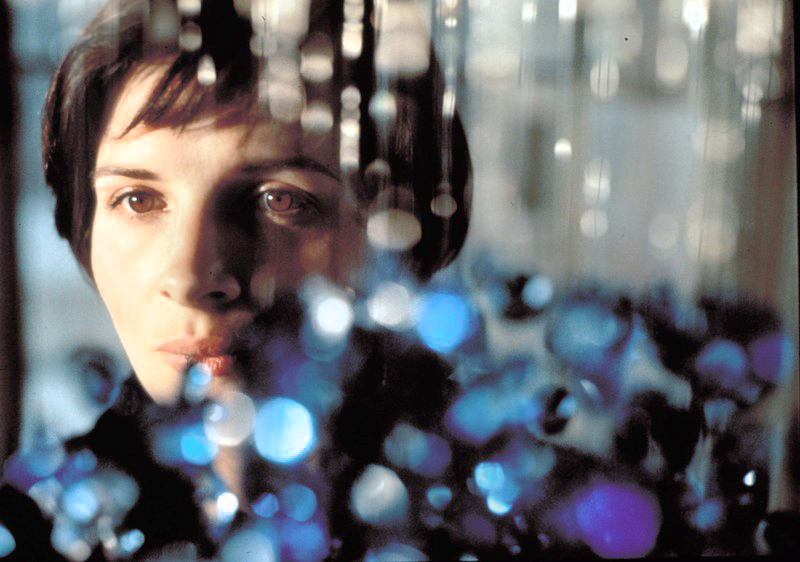 'In this film, blue symbolises all sorts of emotions and experiences, sometimes conflicting,' wrote Joseph G. Kickasola (The Films of Krzysztof Kieślowski: The Liminal Image). 'Kieślowski's camera makes the colours into rich, intentional screens to receive our projected feelings'. Despite the fact that the cafe scene is depicted in normal colours, one very important motif is a sugar cube being held by Julie over a cup of coffee. The cube slowly absorbs the liquid, turning from white into brown. She then drops the cube into the coffee. This seemingly innocuous mis-en-scene, shows how Kieślowski was not only interested in the story as moved along by the dialogue (written together with Piesiewicz), but takes time to show such intricacies. Blue won a number of international awards, most notably the Best Film at 1993's Venice Film Festival and Best European Film at that year's Goya Awards. The French value of 'equality' is described in the story of Polish hairdresser Karol (Zbigniew Zamachowski) who marries French Dominique (Julie Delpy) and moves to Paris. The marriage eventually disintegrates, the two divorce, forcing Karol to a life on the streets, and eventually move back to Poland. Unfortunately, he is never able to get Dominique out of his mind, and starts plotting a devious plan. The back story behind the film, which was released in 1993, started being developed back when Poland was still behind the communist wall. Yet Kieślowski was careful not to make a political film. 'The day I can buy toilet paper in a Polish store, I’ll discuss politics,' the director told an interviewer at the 1989 Montreal Film Festival, just a couple of months before the fall of the Berlin wall. As with all films of the trilogy, White was highly regarded by critics, both in Poland and abroad. Desson Howe writing in the Washington Post [http://www.washingtonpost.com/wp-srv/style/longterm/movies/videos/whiterhowe_a0b068.htm] called the film a "continuing testament to the Polish director's poetic mastery'. White won Krszysztof Kieślowski the Silver Bear award for Best Director at the 44th Berlin International Film Festival in 1994. The film's theme of fraternity is depicted in Valentine's (Irene Jacob) relationship with a retired judge (Jean-Louis Trintignant), who eavesdrops on his neighbours' phone calls. The two develop an unlikely rapport, which affects the circles around them. Salon's Jonathan Kiefer compared Red to some of history's biggest literature greats. The film 'is Kieślowski’s 'Tempest'. The judge – a formidable magician and authorial stand-in – is his Prospero. Like Shakespeare’s play, the film is aware of its own theater, and of its place as the summation of an oeuvre'. The film was Kieślowski's last. He retired from film making with a public announcement following the film's premiere at the 1994 Cannes Film Festival. He died at the age of 54 on the 13th of March 1996 – just under two years after announcing his retirement. Red is very complex in its construction. I don't know whether we'll manage to get my idea across on the screen. [...] I've got everything I need to put across what I want to say, which is really quite complicated. Therefore, if the idea I've got in mind doesn't come across, it meant that either film is too primitive a medium to support such a construction or that all of us put together haven't got enough talent for it. But despite the fact that many critics and audiences applaud the artistic qualities of the trilogy, especially the last film, the director treated this praise lightly. 'Film is often just business', he told the Los Angeles Times in 1995. 'I understand that and it’s not something I concern myself with. But if film aspires to be part of culture, it should do the things great literature, music and art do: elevate the spirit, help us understand ourselves and the world around us and give people the feeling they are not alone'.